There are many ways to install vertical ground rods, driving the rods into soil is usually possible and convenient compared to drilling holes as drilled holes should be backfilled with a bentonite / gypsum / Sodium Sulphate mix to ensure reliable conductivity. Although ground rods can be driven using a hand held hammer, it is slow, the rod is subject to damage, and more importantly, the worker is subject to damage! An electric hammer is effective and quick. 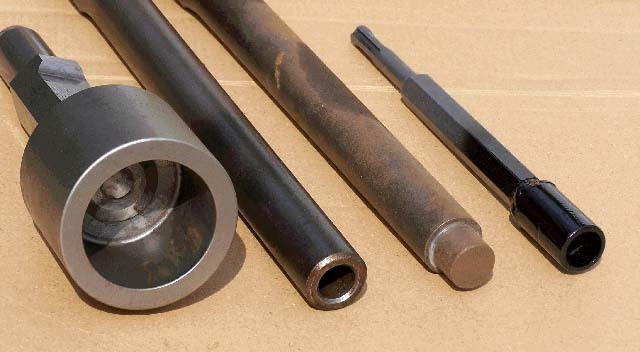 This article shows some tools for driving ground rods with an electric 'demolition' or 'rotary hammer drill'. Driver for star pickets and pipes to 50mm diameter to suit Hitachi PH65A or similar. Driver for copper clad ground rods to 15mm diameter to suit Hitachi PH65A or similar. Driver for 20mm NB gal water pipe to suit Hitachi PH65A or similar. Driver for copper clad ground rods to 14mm diameter to suit SDS-Plus tool with rotation stop facility and of sufficient weight / blow energy. Modified bull point. End cut off in a friction saw, end annealed and drilled, drilled hole squared up with twist drill sharpened like an end mill, end heated and quenched in oil to re temper. Used in a Hitach PH65A demolition hammer (15kg, 1240W, 1400BPM, est 24j), drives 2.4m of 15mm diameter electrode into very dry clay in around 30s. 3 Modified bull point. End cut off in a friction saw, recess turned on end to locate tool end in end of 20mm NB gal water pipe. Modified SDS-Plus point. End cut off in a friction saw, hex shank ground to accommodate sleeve of 15mm NB gal water pipe which is welded to the shank. Used in a GMC RHD1500 rotary hammer (5.5kg, 1500W, 2700BPM, 5.5j), drives 1.2m of 12mm diameter electrode into very dry clay in around 40s. Another candidate is the Hilti TE-Y driving shank and a series of adapters TP-TKS ground rod driving adapters for different rod diameters to suite their TE-76-ATC SDS-Max rotary hammer (8kg, 1300W, 2770BPM, 8j). Couplers can be obtained for joining copper clad ground rods. A rod is driven to near ground level, any burring of the top is ground off, the coupler installed and another rod place into the coupling. The new rod is then driven, and so on until the required depth of rod is achieved. use appropriate PPE when using these tools, particularly eye protection and hearing protection.